Any quantity only $41.99 per oz over spot! 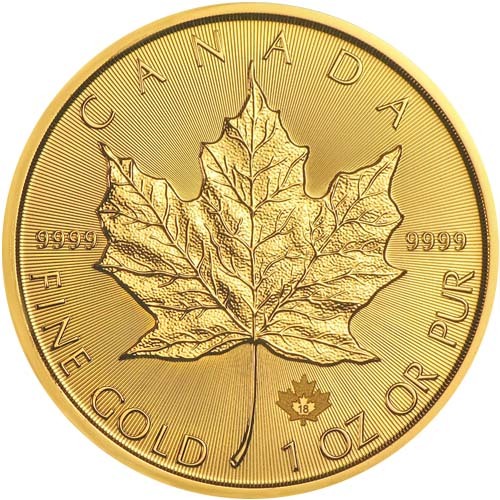 The second longest running gold bullion coin program today is the Gold Maple Leaf. Introduced by the Royal Canadian Mint in 1979 to counter the Gold Krugerrand, the Maple Leaf Series has become a staple of the precious metals industry that investors and collectors alike turn to each year. The 2018 1 oz Gold Canadian Maple Leaf Coin is available to you online today for purchase at Silver.com. Ships to you sealed in individual plastic flips, inside mint tubes of 10, or inside Monster Boxes of 500! 40th year of release for the Gold Canadian Maple Leaf! Consists of One Troy ounce of .9999 fine gold in BU condition. Obverse bears a depiction of Queen Elizabeth II. Reverse includes the design of the sugar maple leaf. All the latest in Royal Canadian Mint counterfeit protection. The 1 oz gold coin in the Gold Maple Leaf series has the latest and greatest enhancements to fight off counterfeiting of gold coins. Introduced in 2015, the coin has radial lines in the background that diffract light and make counterfeiting difficult. What this coin has that its fractional-weight counterparts do not is a privy mark. A micro-engraved year of issue “18” is included within the maple leaf privy mark, and visible only under magnification. The Royal Canadian Mint’s new Bullion DNA is included in these 1 oz coins as well. All coins are encoded, scanned, and cataloged by the RCM for later authentication of individual coins. 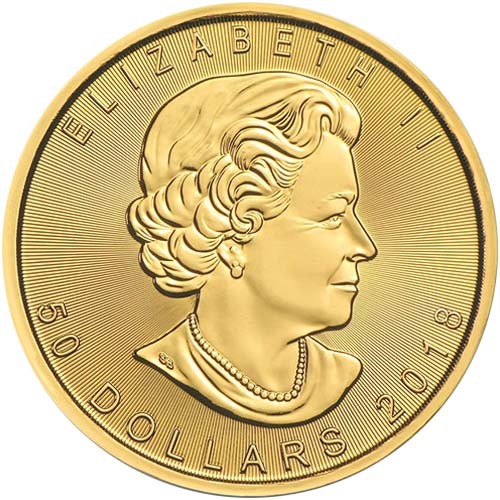 On the obverse of all Gold Maple Leaf coins you’ll find the effigy of Queen Elizabeth II. Since 1979, three different portraits of the Queen have featured on Gold Maple Leaf coinage. This is the fourth-generation depiction created for Canadian coinage in 2003 by Susanna Blunt, and is the only effigy of Her Majesty without a crown. The reverse of all 2018 1 oz Gold Canadian Maple Leaf Coins features the sugar maple leaf. This design has been in use on the reverse since 1979 and has been upgraded to feature the radial lines and privy mark with year of issue. Engravings of “Canada” above the design are accompanied by “9999” on either side of the leaf and “Fine Gold 1 OZ OR Pur” below. All 2018 1 oz Gold Canadian Maple Leaf Coins listed here are in BU condition. Coins in this condition have no signs of wear and tear, but there is the possibility for flaws to occur as a result of striking. These flaws are limited to breaks in the luster, spotted surfaces, and contact marks. We encourage all Silver.com customers to call us at 888-989-7223 with questions. You can also reach out to us online through our live chat and email address with your questions. You’ll also find the current gold price listed on our homepage at all times.